Join us for a one-day workshop with Wibo Koole, a leading mindfulness teacher, author and speaker in the field of mindful leadership. Based on his extensive work as an international business consultant and mindful leadership trainer in organisations, he has written the bestselling book, "Mindful Leadership. Tools to help you focus and succeed", which provides the first comprehensive framework for mindfulness-based leadership and teamwork. This workshop will provide an invaluable introduction for those in or aspiring to leadership or managerial positions on how to bring mindfulness into their work. A leader’s capacity to help others do a better job determines their own success. In a constantly changing environment, they are the link between the people they work with, their motivation and the broader purpose of their team and organisation. To excel, leaders need to develop mental resilience, emotional agility and effective communication. Mindfulness builds the foundation for these qualities. By training your ability to be mindful, you can become more resilient – feeling less dragged along and more alive and energized, and better able to keep a balance between your private life and work. This translates to having more time to reflect and keep a strategic overview, while also improving your ability to listen and communicate effectively and objectively as a leader – in conversations, discussions, and meetings – which is a key to successful collaboration. With increased control over your attention and focus, you can more productively deal with the challenges a manager or executive faces every day and switch with greater ease between reflection and action. Mindfulness can also reduce the stress of common difficulties on the road to effective leadership, such as permanent work pressure and endless sacrifices. Through an improved awareness of your own inner challenges, you can improve your social and emotional intelligence and better understand the rules of successful teamwork. Develop your own meditation practice for mindful leadership. The day will include a mix of presentation, group discussion, and basic meditation practices. No prior mindfulness experience is required. 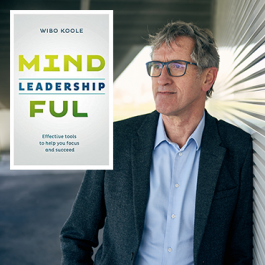 Wibo Koole is Co-Founder and Director of the Centrum voor Mindfulness in Amsterdam and architect of its widely acknowledged leadership program Resilience in management, mindfulness-based leadership in 10 weeks. The Centrum voor Mindfulness is the largest Dutch provider of mindfulness training programs in organizations and a European centre for teacher training in mindfulness and compassion. Clients range from ING, Airbus, KLM/AirFrance, Schneider Electric, Triodos, OLVG and Bernhoven hospitals, Inter IKEA Systems, City of Amsterdam, City of The Hague, Ministry of OCW, GGNet and many others. The Centrum and Wibo especially are committed to develop evidence based mindfulness programs in the workplace and for leadership. He is doing research in this field and is the co-chair (with Michael Chaskalson) of the pre-conference workshop and three symposia on Mindfulness in Organisations at this summer's International Conference on Mindfulness. Wibo is the co-founder and director of the Centrum voor Mindfulness in Amsterdam, where he undertakes research on mindfulness in the workplace and mindful leadership, and teaches mindfulness programs for leaders and corporations. Beside teaching mindfulness, Wibo works as a management consultant and leadership expert for innovation in complex systems, and has an extensive background in working in management himself. He is a public speaker on leadership, mindfulness and organisational development and author of the bestselling book, "Mindful Leadership. Tools to help you focus and succeed". Wibo graduated with honors in political science at the University of Amsterdam, and took the Advanced Management Program at the Wharton Business School (UPenn, Philadelphia, USA). He is a certified mindfulness teacher and is a member of the Presencing Institute (MIT, Boston, USA) Global Practitioner Group. He studies Vipassana meditation and other contemplative traditions and has expert knowledge of modern scientific insights on mindfulness meditation and its applications.